Quality one bedroom cottage in Gower village of Llanmadoc, walk to pub with food, shop, beach. Quality SKS bed. Lux en-suite. Logburner, WIFI, Sky/BTSports, washer/dryer, d/washer, dog secure garden, o/r parking. Coastal village location. Lounge with Sofa bed. (We allow two small children, or one teenager or adult to stay at the cottage in addition to two adults in main bedroom). Useful if family visit you for a few days while you are in Gower. Peaceful, private, quality one bedroom cottage (+sofabed) in Gower Llanmadoc Village, walk to shop PO & coffee shop (70m away across road). Sleeps 2 + 1 e.g. a couple with a child/teen. The Britannia Inn pub food (10 mins walk), beaches (20 mins of gorgeous rural lanes/paths). Quality 6x6ft bed (SKS). Lovely en-suite bathroom/WC. 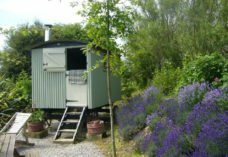 Woodburner, BT WIFI, Sky/BT Sports, washer, dryer, dishwasher, enclosed dog secure garden, o/r parking. Coastal village location. Takes 3+ dogs. SWest facing patio via french doors. Denby crockery, quality pocket sprung bed, travertine tiled bathroom. Walk in shower with choice of mixer or electric showers. Pure DAB radios, HD TV. Reviews on owners website. As well as four miles of mostly deserted L shaped beaches from Broughton one end to the Bird watching hut at Burges Island the other – you can walk directly from the cottage (car not needed) to some of Gower’s best coastal and rural walks including streamed wooded valleys at Stembridge, Cwm Ivy lane, Betty Church and Cheriton woods, Whitford Burrows and Broughton / Hilllend dunes. Local birdlife regularly visiting the bird-tables. Why not visit the local pottery in Cheriton or craft shop and coffee shops in Cwm Ivy. Many guests walk over Llanmadoc Hill to Rhossili Beach and Llangennith Village (2 miles) and even extend their walk over Rhossili Down or along the beach shelf, passing the famous Old Rectory, to the Village at Rhossili (4 miles away from Heather Cottage).